#1. "The March of Death via Route of Freedom" event is on! Five thousand people have set off on a three-day march to Srebrenica ahead of events marking the 15th anniversary of Srebrenica genocide on 11 July 2010. They are set to retrace the path taken over hills and through dense forests by some 15,000 Bosniak (Bosnian Muslim) men, boys, and elderly trying to escape mass killings in Srebrenica after the town, which had been declared a United Nations “safe haven” in 1993, was overrun by Bosnian Serb forces on July 11, 1995. In the photo above: Participants of Srebrenica's memorial march gather in the Eastern-Bosnian village of Nezuk, on July 8, 2010. Marchers will travel three days over more than 100 kilometers, on foot, through woods and rough terrain to arrive late on July 10 in time for a mass burrial ceremony of the 1995 Srebrenica victims, scheduled on July 11. 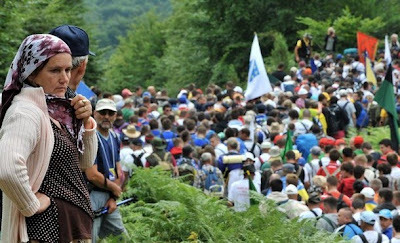 This is the longest annual Peace March in Europe, stretching through more than 100km of the most beautiful countryside in the World. 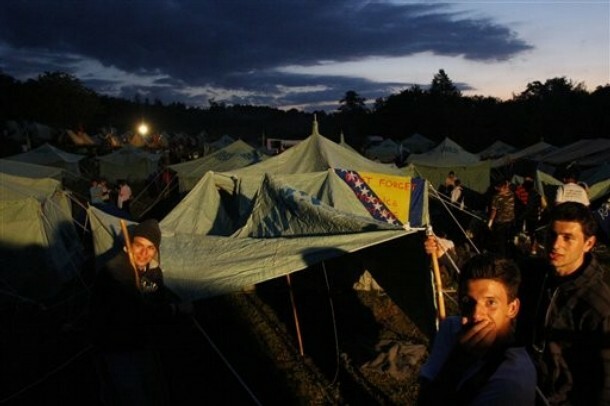 It is organised in honor of 12,000-15,000 Bosniak men, boys, and elderly who attempted a humanitarian breakthrough after the fall of Srebrenica on 11 July 1995. Bosniak men, boys and elderly marched through dense forests hoping to reach a territory under the control of the Army of the Republic of Bosnia-Herzegovina. More than 8,000 victims never made it. #2. This march was organised in honor of those who escaped the Srebrenica massacre and travelled the route seeking refuge in Bosnian Muslim held territory. This year's mass burrial of the remains of Srebrenica 1995 victims, marking the 15th anniversary of the fall of Srebrenica, is organised for at least 775 bodies that were collected from mass grave sites in Eastern Bosnia and identified through DNA science. #3. 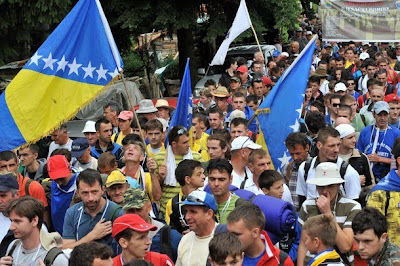 Bosniak people hold various Bosnian flags at a start point of a three-day march to Srebrenica, from the village of Nezuk near Zvornik, 120 kms northeast of Bosnian capital Sarajevo on Thursday, July 8, 2010. Some hundreds of Bosnians began the about 40 Km (25 mile) march along the route taken by survivors used 15-years ago to escape the Bosnian Serb killings in Srebrenica, thought to be the worst massacre in Europe since World War II. #4. 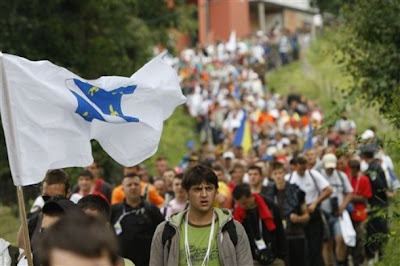 Participants of Srebrenica's memorial march gather in the Eastern-Bosnian village of Nezuk, on July 8, 2010. Marchers will travel three days over more than 100 kilometers, on foot, through woods and rough terrain to arrive late on July 10 in time for a mass burrial ceremony of the 1995 Srebrenica victims, scheduled on July 11. 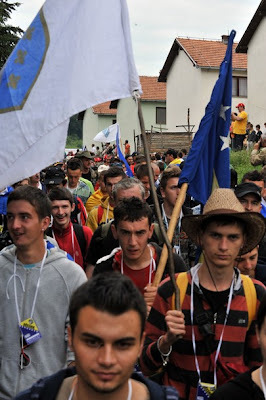 This march was organised in honor of those who escaped the Srebrenica massacre and travelled the route seeking refuge on the territory of Army of Republic of Bosnia-Herzegovina (ARBiH). #5. Participants of Srebrenica's memorial march gather in the Eastern-Bosnian village of Nezuk, on July 8, 2010. Marchers will travel three days over more than 100 kilometers, on foot, through woods and rough terrain to arrive late on July 10 in time for a mass burrial ceremony of the 1995 Srebrenica victims, scheduled on July 11. #6. 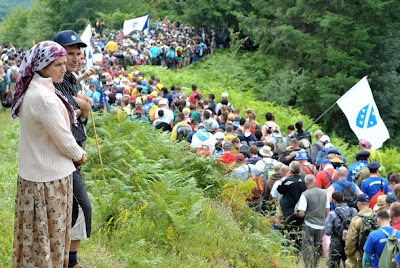 Bosnian Muslim villagers (L) observe as participants of Srebrenica's Memorial March (approximately 5000 people) gather in the Eastern-Bosnian village of Nezuk, on July 8, 2010. Marchers will travel three days over more than 100 kilometers, on foot, through woods and rough terrain to arrive late on July 10 in time for a mass burrial ceremony of the 1995 Srebrenica victims, scheduled on July 11. This year's mass burrial of the remains of Srebrenica 1995 victims, marking the 15th anniversary of the fall of Srebrenica, is organised for at least 775 bodies that were collected from mass graves around Srebrenica and identified through DNA technology. #7. Bosnian Muslim villagers (L) observe as participants of Srebrenica's Memorial March (approximately 5000 people) gather in the Eastern-Bosnian village of Nezuk, on July 8, 2010. Marchers will travel three days over more than 100 kilometers, on foot, through woods and rough terrain to arrive late on July 10 in time for a mass burrial ceremony of the 1995 Srebrenica genocide victims, scheduled on July 11. #8. Bosnian people prepares a tent at stop point on a three-day march to the Srebrenica, in the village of Nezuk near Zvornik, 120 kms northeast of Bosnian capital Sarajevo on Thursday, July 8, 2010. Over 5,000 people have started more than a 65 mile (100 kilometer) march along mountain paths in Bosnia to commemorate the 15th anniversary of the Srebrenica Genocide. "Have you seen my son? 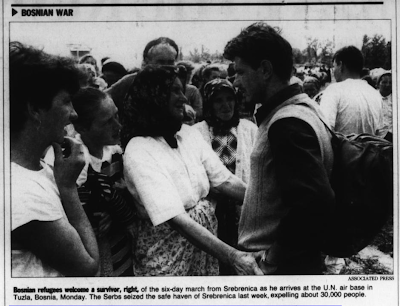 ", July 1995: Bosnian refugees welcome a survivor, right, of the six-day march from Srebrenica as he arrives at the U.N. air base in Tuzla. The Serbs seized the safe haven of Srebrenica last week expelling about 30,000 people.